A free Snow White mini-adventure! After meeting with Viscount Sihteeri, the PCs are in the dining courtyard, discussing the best way to approach their task of sweeping the royal party’s chambers for danger. Prince Ruhtin and Princess Lumi enter the room and approach the main dining table, apparently discussing the upcoming nuptials. As the two lovebirds are engaged in quiet conversation, the room is filled with a tinkling sound followed by a grating noise, as if someone was rubbing the edges of two pieces of glass together. Without warning, shards begin to fall from the glass roof of the room. 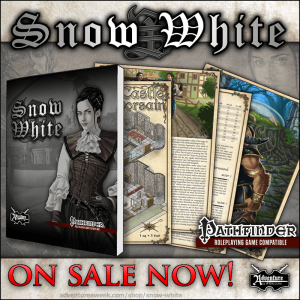 Snow White Mini-Dungeons are single page, double sided Pathfinder RPG compatible adventures designed for use in the Snow White adventure by AAW Games but may be easily inserted anywhere in your own campaign. Featuring info on the golem itself and the rather complex set-up, the encounter is exciting and diverse and emphasizes PC-competence versus that of regular creatures – nice! Editing and formatting are very good, I noticed no significant glitches. Layout adheres to a beautiful 2-column full-color standard and the pdf comes sans bookmarks, but needs none at this length. The pdf sports a small version of Ruhtin’s excellent artwork from the main Snow-White book. Cartography is full color and surprisingly good for such an inexpensive pdf, but there is no key-less version of the map to print out and hand to your players. Will Myers delivers a great expansion to the main Snow-White module; while not a dungeon per se, this instead opts to be a great encounter that supplements the main module well. It’s just one encounter – but it’s a great encounter with cool visuals…and it’s FREE. Seriously, go get this right now if you’re planning on running Snow-White! My final verdict will clock in at 5 stars + seal of approval.